Pizza Uttapam (Savory Indian Pancakes turned Pizza): Soft and delicious uttapam / savory Indian pancakes turned into 4 different pizza. Perfect for kids menu. These can be served as breakfast, lunch or dinner. Today’s recipe is all about kids and parents…kids who love eating pizza and parents who want to feed them more of vegetables and homemade food. So, why don’t we mix both of these choices and make something that pleases both? Sounds Awesome?!! 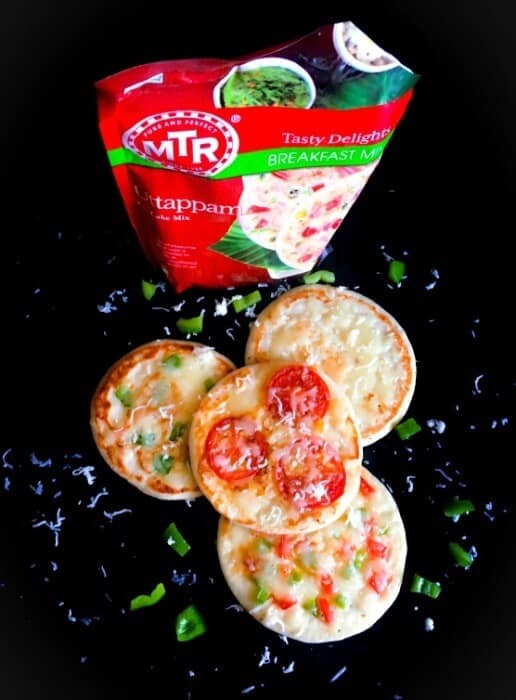 Made using MTR Uttapam – Breakfast Mix and ready in 10 minutes, it surely is a treat for kids of all ages. 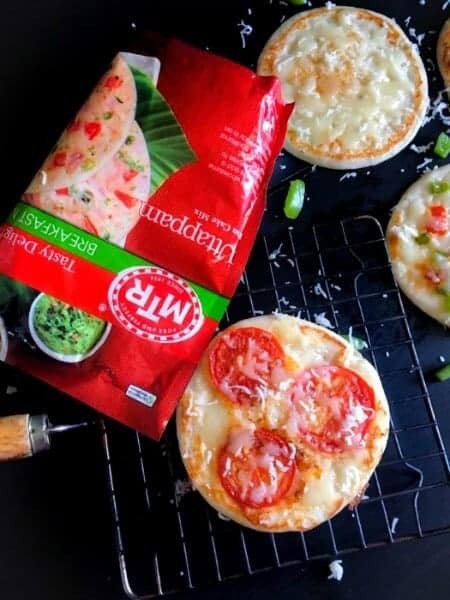 These Pizza Uttapam are absolutely delicious, soft and easy to make. 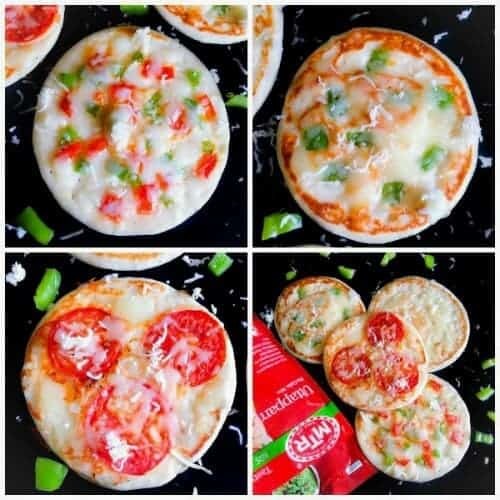 You can make them with any cheese/veggies combination that your kids love or simply hide the veggies in the pancake and sprinkle some cheese. Whichever way you serve them, they will surely bring a smile to your kid’s face. Of all of them, the the ‘Tomato + Cheese’, and the Cheese Topping Uttapam was a Winner each time. 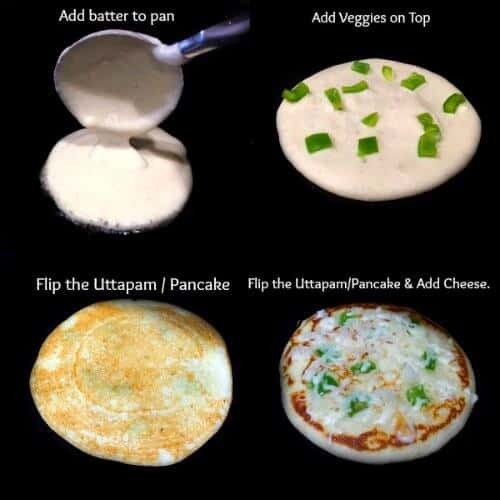 For my friends, who’re wondering ‘What is an Uttapam’? It’s a savory Indian pancake made using fermented (rice + lentil) mix and a very popular Indian recipe. The batter is made mixing both the flours together and needs to be properly fermented. Hence the Uttapam process actually starts 24-36 hours (depending on how hot it is) earlier than you make it. But the MTR Uttapam Mix gives you the same flavor minus the hassles of doing the fermentation yourself. Hence, you can easily make this Uttapam instantly and treat everyone to a delicious hot breakfast. These MTR Breakfast Mixes have become quite a favorite among my family and friends here in the USA and an absolute necessity on Sundays. A day when everyone in the family wants different things to eat and you absolutely don’t want to spend hours in the kitchen. That’s when these MTR Breakfast Mixes come so handy, everyone gets their choice of food, you don’t slog hours making them nor do you compromise on taste or quality. 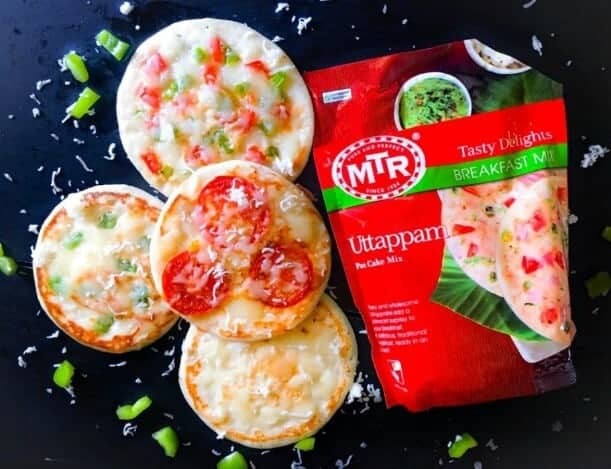 Seriously, if you haven’t tried them yet, you NEED to get them ASAP and try the Pizza Uttapam (Indian Pancakes turned Pizza) . 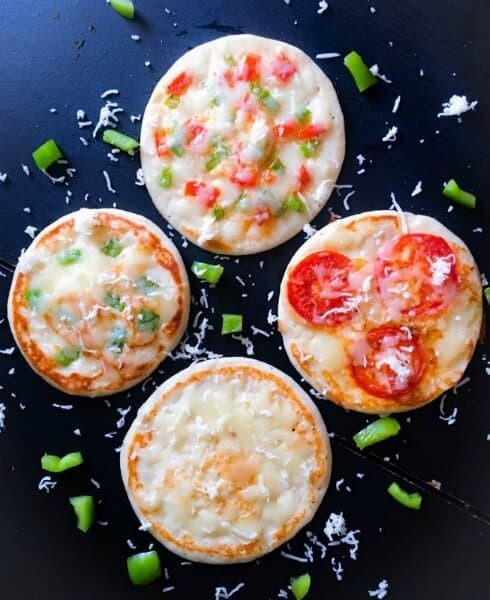 Try this Pizza Uttapam (Indian Pancakes turned Pizza) today and see your kids devour every bite of this delicious goodness. There are times when you are striving to meet a deadline, rushing to honor an appointment or just busy and do not have the luxury of stepping into the kitchen to fix yourself a healthy meal. 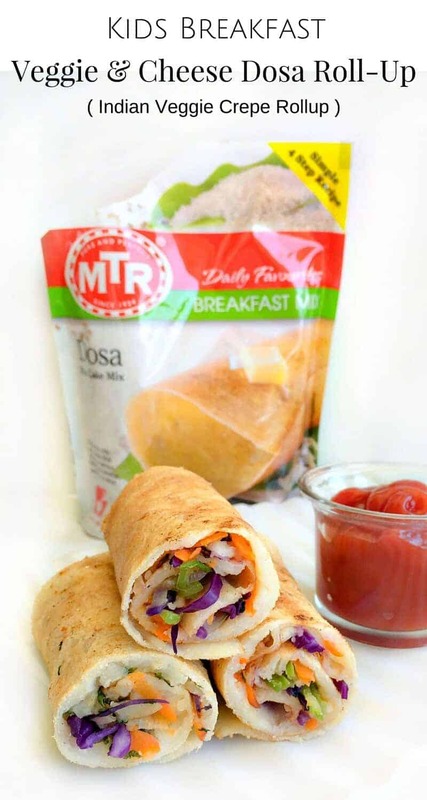 Guys, ‘MTR Foods’ has recently launched their Breakfast in a Cup range! You may pick up anyone from the Upma, Poha or Khatta Meetha Poha. Just add hot water, and voila in 3 minutes, you have a piping hot healthy meal! So now, there are no excuses for missing a meal! 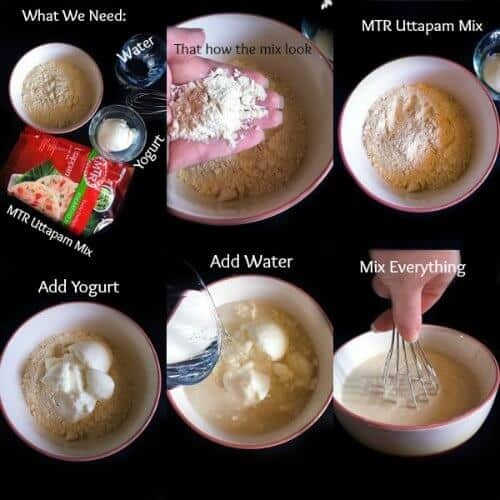 Take a big bowl and prepare the MTR Uttapam Mix as per the package instructions. (I've used the entire packet content with 1 glass of water + 1/4 cup of yogurt). Whisk the uttapam/pancake batter to a smooth paste (making sure no lumps are there). Heat a non-stick pan and add 1 tsp of oil. Add 1 and 1/2 ladle of the uttapam batter and swirl to form a thick circular shape. Add chopped capsicum (2-3 pieces) and let the pancake cook for a minute. Flip the pancake to the other size and cook for another minute on medium heat. Now, flip the pancake (stuffing side up) and add cheese, let it melt for 20 seconds and transfer on serving dish. Similarly make the other pancakes with capsicum, tomato or just cheese topping. Serve Hot with choice of chutney or sauce. 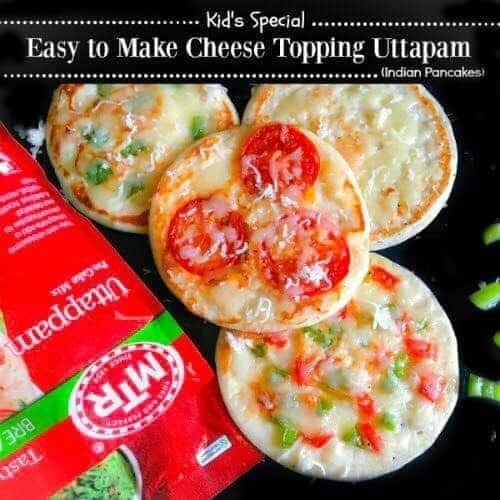 1 Reply to "Pizza Uttapam (Savory Indian Pancakes turned Pizza)"
Wow, a good way to make a simple yet healthy recipe for kids.